FULTON, NY – Clients in the Catholic Charities of Oswego County’s Step By Step Wellness program are experiencing the joy of gardening as they participate in the program’s horticulture group. 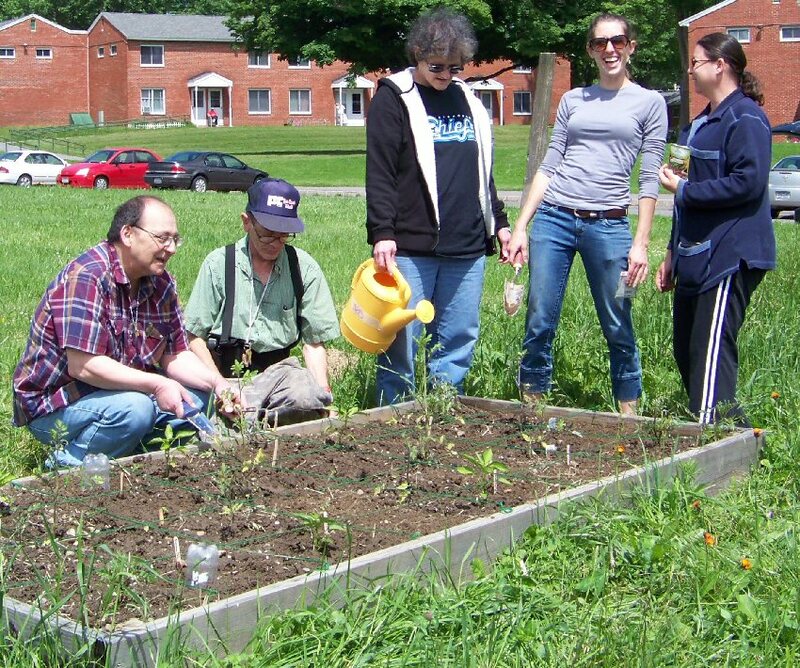 Weather permitting the group meets every Monday, Wednesday and Friday to tend their plot in the Fulton Community Garden at John Lincoln Park. Members of the horticulture group at Catholic Charities’ Step By Stop Wellness program tend to their plot of vegetables in the Fulton Community Garden project at John Lincoln Park. The horticulture group is one of the many groups, activities, and workshops that the Wellness Program offers that are designed to assist in the recovery of adults diagnosed with a mental illness. The horticulture group as well as other workshops and programs, are open to all clients. From left are: Nick, Carl, Maureen; Step By Step generalist Desiree Allen; and Jessica. According to Pam Peeling, coordinator of the Step By Step Wellness Program participants in the horticulture group began planning for their garden weeks in advance. “We created an indoor hydroponics garden so that we could grow our vegetable plants from seeds and transplant them when our plot in the community garden was ready. With the plants that our clients grew, and the plants that we received from Cornell Cooperative Extension, we have a garden plot filled with a variety of vegetables. Our clients are enjoying the project and are looking forward to when they can harvest the vegetables they work so hard to grow,” she said. Administered by Catholic Charities of Oswego County, the Step By Step Wellness program uses a wellness recovery model that provides an array of services to adults diagnosed with a mental illness and assists them in their recovery. The horticulture group as well as other workshops and programs, are open to all clients. For more information on the Step By Step Wellness program, or learn about becoming a participant, contact Peeling at 315-598-3980. Catholic Charities of Oswego County serves all people in need regardless of their religious affiliation. Primary funding sources for Catholic Charities of Oswego County’s programs are the United Way of Greater Oswego County, the Diocesan Hope Appeal, the County of Oswego and private donations by individuals and local companies and organizations.